Yes, I’m nuts! Thanks to Chris from The Isle for the jewellery! Today is the 10th March and my 32nd birthday. It was also supposed to be the day of my 5th session of chemo however I hadn’t taken the steroids in preparation for it so they sent me away from the hospital for me to do my chemo tomorrow instead. I’m extremely disappointed as I wanted to mark my birthday with a chemo session and I had especially picked out a nice colourful chemo outfit. I have forgotten where I was for most of my birthdays but I wanted to look back when I was 77 and always remember where I was and what I was doing for my 32nd birthday. Yes, I am nuts! At least my 32nd birthday will be the day I nearly did chemo! I’m also declaring today, 10th March, as an international celebratory “Love Your Head” day. 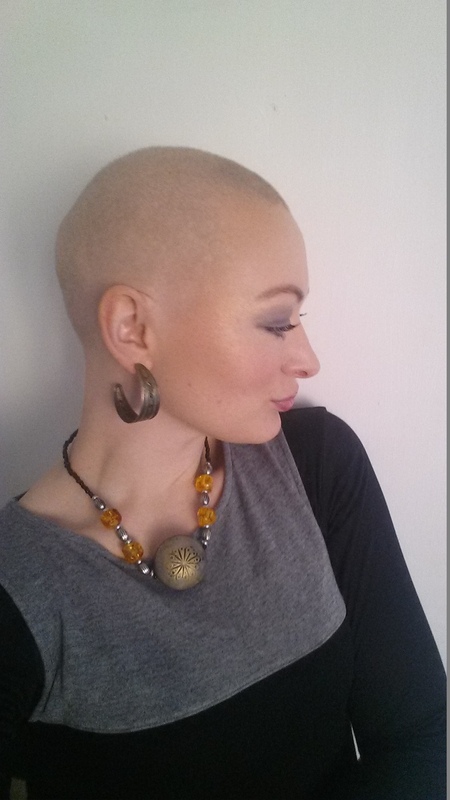 My wish is for all fellow fabulous female Chemotarians around the world to rejoice as they confidently take off their wigs and headscarves to unveil their beautiful heads underneath and to proudly wear their heads instead. I love the intriguing looks I get from people as I go about my day. When I catch them curiously looking at me, I smile at them to invite them to look some more. I appreciate their curiosity. I command attention and I command respect. I stand out and I love it. My bald head represents my inner strength. I have had so many people come up to me to compliment my head. When I immediately tell them with a big smile “Why thank you! It’s for Chemo!”, they then tell me personal things about their own lives. It’s not only the greatest ice-breaker, but a friendship former too. I always was a people’s person and thanks to my head, it has allowed me to interact with so many more people than I would have when I had hair. As a result it has allowed me to touch their lives, share my story as they have to me. Previous Post Snoods of Fun! If i may say… Yes you’re nuts but beautiful! When you’re 77 you can think back and say Gee when I was 32 I was just as forgetful as I am now!